There were moments in the past few years when my inbox reached over 1000 unread emails. I felt like I was drowning each time I looked at my Outlook or my phone email app. I remember when I used to take pride in how “connected” I was – how I could be contacted at almost any time and how I could connect with so many others in so many ways. Then I started to realize that being so connected was actually causing me to disconnect with those right in front of me – my family, my friends, my colleagues. I was missing so many moments because I was either staring at a screen or sitting there pondering how I should respond to a challenging email, tweet, or post. New plan. I was still convinced that I needed to be connected for work purposes and that Twitter and Facebook were the problem so I took these apps off my phone. This worked wonderfully as I was not being drawn into conversations and I was able to be way more in the moment when I was either with family and friends or at work. There was still a big problem. I felt that in order to keep up with the many (often over 100) emails each day, I needed to regularly check my emails on my phone. I was convinced that if I did not do this, I would fall way behind in the inbox battle. I started to read more books on increasing focus, organizing my mind and life, and disconnecting more often. In almost every one of these books, they gave the same recommendation: only access email from your computer and only do this at certain times during the time at work. I recall thinking that, “yeah, that may work for some people but, as a principal, I get over 100 emails a day… this is not going to work”. I continued this addictive pattern of regularly checking my emails on my phone to keep up with all the emails. About a year ago, I happened to be sitting next to a colleague, George Kozlovic, a high school principal whom I have a ton of respect for and who seems to be well connected in the world of education, and he happened to share that he did not have email on his phone. Wait a minute… the principal of one of the largest high schools in the province does not need to have emails on his phone? I pressed for more info and he said the same thing that the books said – he checked it only from his computer when his purpose was to check emails. Hmmm…. Koz got me thinking. Last summer, I needed some pure family time so I did it… I took email off my phone (I can just hear how “proud” my dad would be of me for this “gigantic” step… haha #notsomuch … as he shakes his head about people on those stupid phones). Yes, this is a no-brainer for many people like my dad but for me, this was a significant step. What if someone needed to contact me about the school? What if someone needed something? How many emails would I have when I checked in a few days??? It was the summer so I thought it would be an easier step to see if these were actually real questions to be worried about. Freedom! 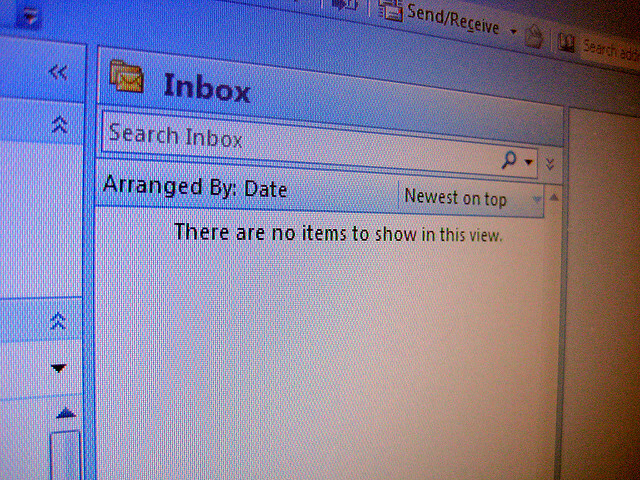 Wow, the fact that I could not check my emails from work freed me up to just simply BE. I could BE a dad. I could BE a husband. I could BE me! I would forget where I left my phone more often as I didn’t check it. I was less interrupted and got into “flow” more often doing tasks I wanted to do (as research continues to show how ineffective multi-tasking is for getting anything done). After a couple weeks (yes, 2 weeks) of no emails, I checked my email expecting to learn something huge about school or work and to get that inbox drowning feeling again… but I had hardly any new emails and none of these were urgent. I did this for the rest of the summer checking emails every 1-2 weeks… but could I really do this during the school year? If you always check your email… you will think you always have email to read/write. By not checking emails so often, I write way fewer emails. Because I write way fewer emails, I get way fewer replies. The number of emails I get each day is about half of what I used to get. Many emails that I once thought I needed to respond to… I now know do not always require a response. The string of “reply-all” emails can be scanned and deleted rather quickly (unless it this conversation is a priority). Sometimes an email is sent to me and by the time I check in the morning, the issue has been resolved. By being so available, I was making myself more needed than was necessary. If it is something urgent, all staff and colleagues have my cell number but people do not want to interrupt family time. I think people believe that email is less intrusive as it is up to the receiver to check their inbox… which I now know is true. Staff will now send an email knowing that I will likely not respond until the next day. I am more focused during email time and I believe I write more effective emails. I found when I used to email on my phone, my emails were less professional and much quicker (especially my responses). Now, my emails are a bit longer but I feel have more clarity with a more professional tone. I can accomplish way more in a day than before. It takes minutes to get back to what we are doing each time we get distracted so being pulled away by emails causes everything else to take longer. I am winning the inbox war. My inbox rarely gets above 10-15 emails that require a response and I can often get this back down to zero in the morning before school. In the evenings and on weekends, I am only at work when I choose to be at work. I still need to work many weeknights and some hours on the weekends but I am not drawn into a work mindset by an email that comes on my phone. I can also now be on my computer working at night and not check my emails which also increases work efficiency. I realize there are people that are reading this and thinking, “Wejr, man, you had a problem when you were tied to your phone that much”… and they would be right. I wasn’t alone, though. Even at work, in meetings, an email would be sent to our admin team and I would hear phone after phone buzz or beep and see people like me leave the moment to check our phones. That WAS me. I was so worried about missing out on something from outside that meeting… that I was missing out on the discussions taking place inside the meeting. We live in a time where there is an expectation to always be connected. This is a trend and expectation that needs to stop. At our last admin meeting, our superintendent provided some wise words and encouraged us to avoid checking email between Friday evening and Sunday evening to help with wellness. Many educators have a concerning work:life (lack of) balance so strategies like this are important to implement. I encourage people to take an additional step to take the notifications off and, even better, get the emails off your phones. Yup, I did have a problem with a bit of an addiction to checking emails and a problem with feeling like I was drowning in my inbox – but I think I have solved this one. By taking email off my phone, I am winning the inbox battle and living way more in the moment that is right in front of me. It is no secret that I have concerns with the focus on awards in schools. For the past 9 years, I have been privileged to work as a principal in two different school communities who have both moved away from traditional awards ceremonies. As someone once told me, “we need to be hard on ideas and soft on people” – this is a satirical criticism of the IDEA of traditional awards ceremonies in schools and is meant to highlight issues with (and challenge people to rethink) the use of these in schools, and is NOT meant to be a criticism of parents nor educators. Defeating others is crucial to the success of our children, and it is our role, as educators and parents, to prepare our students for the big bad real world that is out there that will eat you up and spit you out. I was having trouble sleeping last night so I came up with a list that will help me raise my kids as well as my students to become better than others and win more traditional awards at school. Have parents with higher income. There is also a correlation between socioeconomic status and traditional achievement in schools so, again, it makes a difference if the parents have more financial and cultural capital to access more support and educational opportunities. Be born in the first 3 months of the year. Schools organize students by date of birth (or as Sir Ken says, “date of manufacture”) so being born in at the start of the year can give a student a significant advantage. In Canada, a child born in January could have almost 12 months of advantage through growth and development as compared to a peer born in late December (some states use September as the cut-off so it would be a similar comparison to a child born in September and a child born in August). Although the date of birth has less of an impact as the student get older, it makes a difference in schools for early learning opportunities and resulting student confidence and self-efficacy. Place the majority of the focus on getting good grades. Many awards are decided based on who has the top marks in the grade level so getting a good percentage and/or GPA is essential to cleaning up the awards. Therefore, it is important to pay less attention to soft skills and the process of learning and more attention to getting good grades. The 0.1% in the grade book can make the difference between an award-winner and an award-loser so it is important to ask for bonus marks and do everything to collect the most points in school. Avoid collaboration. Remember that the people around your child/student stand in the way of him/her winning the award. Awards are only won by defeating those around you so, by collaborating, you could be hurting your chances as you may be making those around you that much better. Avoid courses that challenge the student. As was stated in #4, the goal is to get top marks so by enrolling in courses that are not an area of strength and that are challenging for the student could result in lower marks. Also, I have heard that students can enrol in courses with “easy-markers” (I am not sure what this means though) so this could help their chances at winning as well. Self-promotion is key. Decisions on awards are sometimes made as a team so it is important that academic accomplishments are shared so everyone knows the top grades and other achievements that have been attained. Also, awards are heavily based on short-term extrinsic motivation so self-promotion, along with the focus on grades, will help keep the emphasis on the extrinsic (rather than intrinsic). Attend a small school. 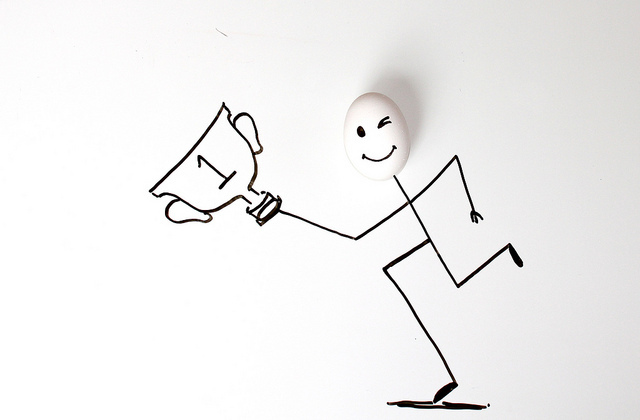 Winning awards is not about achieving some standard or level, it is simply about being better than those around you. If you attend a smaller school, you have a much better chance of winning as there are fewer students around you. Give awards out in the home and community. Because awards mean that we stand for excellence, it is important to also give awards in your home to your top child. This will not only highlight excellence but also help teach the other child that loses the award how to cope in the big, bad real world. Outside the home, work with the community to give top parent awards and top children awards so families and community members can also compete with each other in the promotion of excellence. Comply, comply, comply. A great way to getting top marks is to colour inside the lines and think inside the box. Do not question the way things are done or try to be creative and do things in new ways as this may mean that you will not do exactly what the school is asking and, therefore, risk getting lower grades. There is a game within in school and those who learn the rules of “doing” school well and comply, collect the most points, and beat those around them… win! As you can see, there are so many variables that are beyond the control of our students that impact who wins the traditional awards in schools. Parent education, parent financial and cultural capital, student month of birth, school size, etc all provide some students with an advantage and leaves others with a disadvantage. We, as educators, often express concerns about school rankings because of these aforementioned factors yet we rarely question the ranking (well, ranking by placing at the top) of students in schools that are affected by these same factors. Most of the time, parents and students are doing the best they can but face hurdles outside their control which can affect achievement at school. As a community, we need to help ALL students go over/around these hurdles so we can create the conditions to bring out the best in each of them. Having said this, we need to ask ourselves, as a school community, if traditional awards ceremonies actually promote excellence and bring out the best or if they simply promote achievement using narrow criteria defined by adults within the building. Are awards the best we can do to highlight student learning and growth in our schools? I am not saying that the answer is to “give awards to everyone” (which I oppose) as this creates a whole different issue; I am saying, though, that we need to rethink how we honour our students and we need to create new ways of promoting excellence and celebrating learning that goes beyond our traditional awards ceremonies in schools. Please do not tell me thoughts like these are creating this “enabled” generation of millennial adults (whatever that means.. apparently I just missed the cut-off to being a Millennial). The vast majority of schools still use traditional awards and millennial adults went through schools that used awards… so if a lack of responsibility and independence is a concern (which is a valid concern), let’s talk about this and discuss strategies we can use every day to improve this for our children and community. The late Joe Bower and I had many conversations on this topic and I feel like these thoughts are a tribute to him. Check out one of his posts on this topic here. Further thoughts on Rethinking Awards Ceremonies. Through my work in promoting a strengths-based education and culture in schools, the question often gets raised: where do we to start? People often agree that to bring out the best in people, shifting our lens to a strengths-based approach is where we want and need to go but the thought of working to embrace the strengths of all of our students can be a bit overwhelming. My challenge to people is to start with strengths by starting with ONE. Find one student who you observe to lack connection and that possibly has strengths of skill and/or character that might not being revealed and embraced at school. Take the TIME to get to know this student at a deeper level and work to determine his/her strengths. A few minutes a day of focused time to simply listen can build trust and provide an opportunity to learn and tap into the strengths of a student (think of the difference this would make in a school If every staff member started with one). When we take the time to listen and determine the strengths, we build strong connections and a clearer understanding of how to better engage the child in school. One of my favourite analogies about starting with one is from Rachel Macy Stafford. She writes about how, in schools, we often see the butterflies. They are easy to spot and see their strengths; they fly beautifully in school. 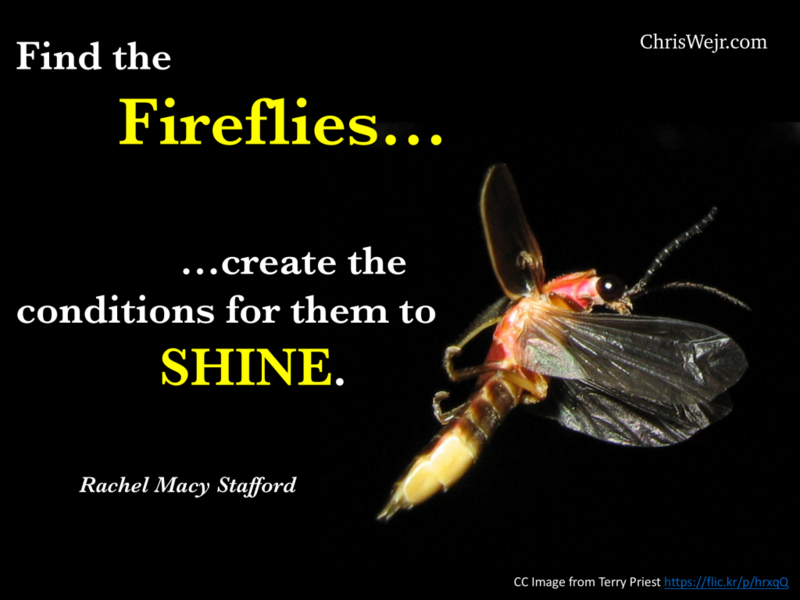 She challenges us to find the fireflies – those students who only shine under the right conditions – and to work to create the conditions for these students to shine more often. When we start with the strengths of one student, that one firefly, we can make a huge difference to this student. If everyone starts with one, we slowly shift the culture of a school to a strengths-based culture; a culture in which fewer students’ strengths go unnoticed and an environment in which our fireflies have a chance to truly shine. Start with one. #StartWithStrengths. Find your firefly. For a deeper look into a strengths-based approach to education and leadership, check out my recent TEDx talk here and below. 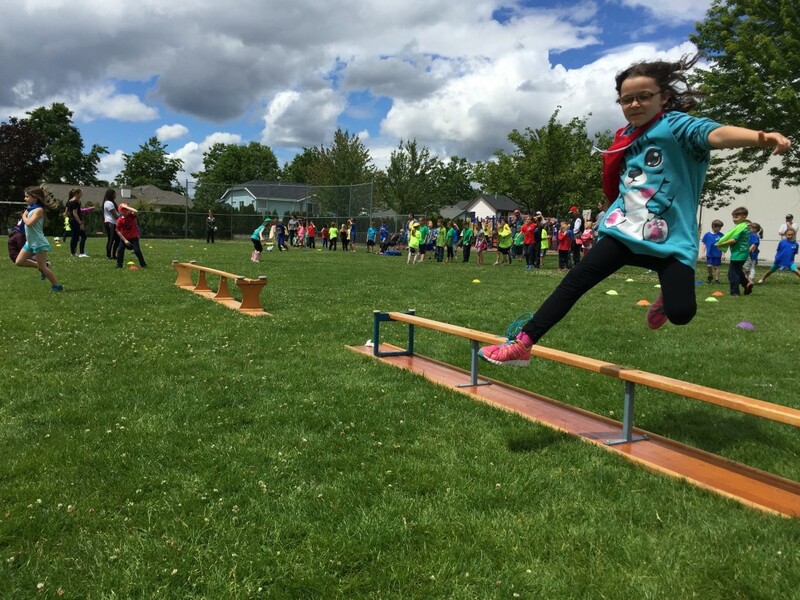 Last year at James Hill, we made the decision to move away from points and 1st-4th place finishes for our annual elementary school Sports Day. We felt that the focus on points and winning was misaligned with the goal of the day. Seeing students and parents arguing with grade 6/7 student facilitators about who finished 2nd and 3rd in the “Rubber Chicken Relay” made it fairly clear that something needed to change. I want to be clear that I am not opposed to competition (ask anybody I have coached or played with or against) and there is a role for healthy competition in youth development. I am not the guy that thinks we should give out participation trophies for everyone for just showing up at a tournament but I do think that we often put the focus on winning when the focus should be on development (that is for another post.. in the meantime, check out Changing the Game Project). I do think that our school’s “Sports Day” (which does not really involve a single “sport” and could be renamed) is a day in which the main purposes are fun, teamwork, and movement. Last year, I did have some questions from parents asking if not focusing on competition was ill preparing our kids for the “real world”. I understand this concern and we do provide opportunities for our older students to compete in floor hockey, track, cross country, basketball and other artistic and academic competitions. For Sports Day, I strongly believe we need to align our activities with the purpose and goals of the event. I am not sure, though, if winning the “Bottle Fill Relay” is the real goal of sports day and helps to prepare our six-year-olds for when they are 18 and entering the world beyond school. I do know that focusing on movement, fun, and teamwork is a great way to spend a day together as a school community. Not having the points and placings has really helped to create more of an inclusive sports day. In the past, when a child with any type of physical or mental struggle(s) was placed on a team, there were statements whispered like, “now we are never going to win.” or “there goes our chances”. She went on to say that this year, not having the overt competitive aspect created the conditions that brought out the best in teams. Students were working together and cheering each other on more than in past years. The goal was not to finish first but, for some students, to simply finish with smiles. Those teams that had a child with physical and/or mental disabilities on their team looked to him/her as an asset rather than a liability (it bothers me to say that students looked at others as a liability in the past but for some, it was unfortunately true). Students with struggles were cheered MORE for their efforts and their accomplishments. Nobody said “oh man, we have Steven..”, they said, “let’s go, STEVEN, we can do this!”. More kids cheered. More kids participated. This was the most inclusive sports day ever. The key lesson for me is that our purpose needs to guide our actions. Is there a role for competition in schools? I believe there is but elementary sports day should be about movement, fun, teamwork, and creating the conditions to bring out the best in ALL our kids. Kids will still be competitive with each other in a fun way; however, when we shift our focus away from competition, we get more collaboration, more fun, and more inclusion. There is a simple mistake that the vast majority of us as parents and educators make when dealing with challenging behaviours: we focus on the behaviour. When we focus on the problem behaviour, most of our theories and strategies involve attempting to get less of this behaviour. We bribe with rewards for when the behaviour might not be present and we punish when the behaviour does occur. This type of “behaviour intervention” makes a HUGE assumption… that the behaviour is a motivation problem. We assume that if we can “motivate” (bribe/punish) the child to the thing we want him to do, after enough intervention, he will do it more often. Dr. Ross Greene says this is the philosophy that “Kids do well if they wanna [do well].” This often “works” for the kids who don’t really have any significant challenges with behaviours (although when we try to “catch kids being good”, we end up teaching many kids to be good at getting caught being good and create further problems of kids wanting something in return for doing the right thing) but I have yet to see this work for the students who need the intervention the most. In fact, I have often seen this approach work against students with behaviour challenges; we put a carrot out there (if you do this, we will give you this), the student then realizes he/she is not going to get the reward, and this actually brings out the problem behaviour that we do not want to see. If all we focus is on the challenging behaviour, we miss the most important part: the opportunity to create collaborative solutions for the underlying problems. By assuming that challenging behaviour is a motivation problem… we forget that behaviour is a SKILL. Behind every action in kids (and adults) are numerous skills that people have learned over the years. Skills like problem-solving, self-regulation, listening, critical thinking, empathy, academics, and many others all play a role in how we behave. This is the BIG idea that changes everything about working with kids with challenging behaviours: “Kids do well if they CAN… if they could do well, the would do well. Something must be getting in the way” (Dr. Ross Greene). This lens changes our role as educators and parents; our role then becomes members of a team that has the task of finding out what is getting in the way. Kids do well if they can…. NOT kids do well if they wanna. When we make this shift in philosophy, we see that behaviour challenges are a result of a lagging skill and/or unsolved problem. By focusing on the lagging skills, we can actually teach kids the needed skills in a way that prevents the behaviour from occurring. I have used the philosophy for a number of years and it has been proven more effective than any other behaviour support I have used; this should not be shocking because when we view behaviour as a skill, our most important job is to teach! If a child struggles with reading, we teach. If a child struggles with behaviours, we don’t simply bribe and punish… we teach. Kids do well if they can. Focus on determining the lagging skills and unsolved problems that are causing the behaviour. Challenging kids are challenging when the demands of a task outstrip their skill level. We need to stop obsessing on behaviour. Instead, we should be emphasising problems (and solving them) rather than on behaviours (and modifying them – when we solve the problems the behaviours are modified). Expectations are important so we need to reflect on what our expectations so we can determine what our student may be having problem meeting. We also need to ensure that the bar for these expectations are close to the skill level of our students… much like we do with other aspects of teaching. Solutions must be collaborative and proactive. Too often, solutions we (as adults) come up with are done TO the child and what we need to be doing is coming up with solutions to unsolved problems (and lagging skills) WITH the child. This does not mean collaborating on consequences… this means collaborating on solutions to problems. (Note: I am not opposed to consequences that are logical and restorative but I think we too often believe that this will solve the problem when, if it is due to a lagging skills or unsolved problem, it rarely solves it and actually exacerbates the problem). Nobody likes a plan done to them yet we do this to kids with behaviour challenges all the time… and it often makes it worse. Model empathy and care. When determined the lagging skills and unsolved problems and we work collaboratively as a team with the child, we show we care and can empathize with his/her struggles in certain skill areas. I have tried to use this philosophy for a number of years with great success, but for some reason, I seemed to have recently sidetracked myself about it. This year, I have continually focused on the behaviours and dealing with what seemed to be crisis management without working hard to understand the underlying unsolved problems. As Greene says, “The more crisis management you do, the more crisis management you do.” We have done a ton of crisis management this year and have done very little of focused discussions on determining lagging skills and unsolved problems and then working collaboratively to help teach the skills and solve these problems. Four members of our staff recently attended a 2-day workshop with Greene and it all came back to me; we realized we have made a number of decisions at school that have not helped with our students struggling with behaviours. We have been focused on behaviours and doing our “solutions” TO kids rather than with them. In the coming weeks and into next year, I look forward to our core team working to use Greene’s approach and working with staff and families to create more success for our students. We need to rethink how we approach behaviour in our schools. We need to move away from a program that focuses on behaviour (and attempting to change with carrots and sticks) and move toward a philosophy that seeks first to understand the unsolved problems and/or lagging skills, then help solve the problems and teach the needed skills. This changes everything. NOTE: I understand that life is full of choices and there are times when behaviour is a choice. I am writing primarily about significant behaviour challenges in this post that we often assume are choices (but have been shown in my experience and many that Greene has worked with) to be caused by underlying unsolved problems. Also, Greene is very clear that PBIS (Positive Behavioural Interventions and Supports) does not align with this philosophy as the focus is often on changing behaviour (with positive rewards/prizes/tickets) rather than determining lagging skills and working collaboratively to solve them. I also like the term “unexpected behaviours” (rather than problem or challenging behaviours) that my friend Karen Copeland has encouraged me to use. The goal of the approach in this post is to make these behaviours more expected because when we know what is causing them, we can work collaboratively to prevent them from occurring. For a quick preview to Greene’s approach, watch the video below. Back in January, we lost a true reformer in education and a close friend of mine, Joe Bower. I have not been able to find the right words to express the impact Joe had on me as a person and as an educator. Few people pushed me more in the areas of motivation and assessment than Joe did. I came across Joe’s blog about 7 years ago and was immediately drawn to his progressive thoughts and ideas. He was not some philosopher spouting off ideas on what others should do… he was actually doing it. He was “being the change”. I reached out to him on Twitter and this led to 6 years of Twitter chats, email conversations, Skype calls, text messages, and phone calls. Joe not only made a difference to his students but also to our students. As we moved away from rewards and awards (as well as shifting the focus to more formative assessment) at our school, Joe became my go to guy for all things motivation and assessment. If I had a quick question, I would fire off a Direct Message on Twitter and he would respond with some advice that would help dialogue at our school. If I needed more of a heart to heart conversation, we would Skype. He Skyped from his school, his home, and even his car – he was always there to chat and help move our school forward. I must have told him endless times that I owed him a beer… and he was always sure to remind me of this. In 2012, Joe and I put in a proposal to present together at a conference in Calgary. It was accepted and we were planning to present on moving away from rewards and awards – he would focus on the classroom side and I would focus on the school side. He would bring the teacher perspective and I would bring the principal perspective. Unfortunately I had to back out because of family commitments. I never knew that I would never get this opportunity again. I never called Joe a close friend as we had never actually met. Now that he is gone and I look back at all those conversations we have had over the past 6+ years, I realize there are few people in my life that I spoke to more often than Joe. He was a close friend and, although we never actually spent time in the same room, he changed me as a person and as an educator. He supported me and challenged me in ways that every close friend would. I am so thankful Joe blogged (I am sure there were moments that drove Tamara nuts as he was on the computer writing late at night). He had so much wisdom and critical reflections that have been shared worldwide and will continue to be shared for years to come. He was a Canadian hero in education to many of us as he stood up and was able to say what so many of us thought. Many people disagreed with him but he stayed the path and was always willing to listen to the other side. His honesty (ok, he was blunt) was refreshing for so many. He has helped so many educators worldwide move to a more positive method of teaching and parenting. In addition to the regret of not presenting with Joe and meeting up for that beer, I regret not knowing him on a more personal level. We joked around about our families but I never saw the tender side of Joe as a father and as a husband. The picture of him with his kids taken by Loni left me sobbing as it was such a reminder of who he was and who will be needing him the most. Someone asked me one time, “what will your legacy be?”. I know Joe has left an incredible legacy in the education world – one that will be carried on for generations. People will look back and say, “I actually talked to him one time” or “as Joe Bower once wrote…”. He was an educator ahead of his time… and he took so much of the heat that has allowed us to make changes more effectively. He also has left a legacy with his friends and family as all his thoughts on child development were reminders on how we needed to rethink some of the things we were doing. As many regrets as I have, I am so glad that I often shared with him how important Joe was to me. He knew the impact he had on my students and on me both as a principal and as a person. I thanked him many times. I would give my left nut (metaphorically, of course) to go back and go for that beer. 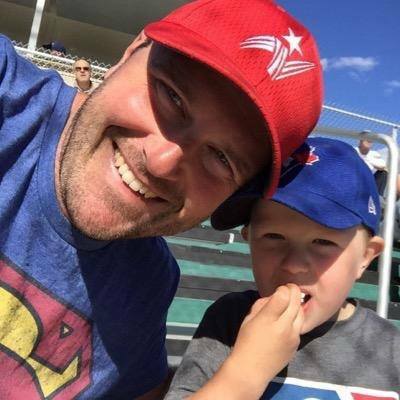 Following his passing, I have been able to text and chat on the phone with Joe’s dad, Jim Bower, and he has shared so many awesome stories of farming, baseball, hockey… and family. He shared a video with me of Joe playing catch with his son… I cannot even think of that video without my heart aching. However, through this, I am finally getting to know the “other side of Joe” – the side that Joe referenced in the private conversations but also the side that so many of us in the education world never got to be a part of. Jim has also shared his desire to keep Joe’s philosophies and ideas alive through social media (check out our A Tribute to Joe Bower Facebook Page) as well as through Red Deer College, a place that Joe attended and was very fond of. Please consider contributing to Joe’s legacy. Joe was a graduate of the RDC/U of A Middle Years Program. Yesterday, a new scholarship was announced at Red Deer College as part of the “20th anniversary celebrations of the Middle Years Program”. This scholarship will support middle level pre-service teachers who demonstrate a passion for learning. The scholarship, called “The Joe Bower ‘For the Love of Learning’ Memorial Scholarship, supports those students who need financial assistance to help pursue their education and become middle level teachers. Not a week goes by where I don’t think, “What Would Joe Bower Do?”… whether it is about working with students that present unexpected challenges, or conversations on homework, or debates on assessment and motivation, I continually reflect on our dialogue and the ideas Joe shared. Let’s work to keep the legacy of Joe Bower alive. Share his posts and please consider donating to the “Joe Bower ‘For the Love of Learning’ Memorial Scholarship Fund” to support future teachers in the middle years program. My heart goes out to all of Joe’s family… as always, I send all my love. To them, I apologize for how long it has taken me to write this. I am so grateful to Joe’s family and close friends who continually reach out to me and the people in Joe’s community beyond Red Deer to maintain a small piece of that beautiful connection we had with Joe Bower. Note: this story of inclusion is shared with the encouragement and permission of Logan’s mother. As Logan has grown, his interests in things like animals (particularly reptiles and insects) were noted and encouraged by staff and his family to be used in school through a variety of projects. One of his grade 3 teachers saw a snake she had never seen before near her home so she took note of the characteristics, came in to the school on the following day and ran it by our expert, Logan, and he was able to identify they type of snake it was. Another staff member embraced his love of animals and ran a school-wide fundraiser, led by Logan, to bring in Canadian Tire money to donate to the Langley Animal Protection Society to help out local rescued cats. During this fundraiser, Logan went around to all the classrooms to share details about the initiative. Because Logan had struggles in communication, he used an iPad to read out the information to the students. Fast-forward to grade 5. In the past few years, although Logan still has a love for Kingdom Animalia, he has developed a keen interest in communicable diseases, nuclear disasters, and safety from these and all sorts of disasters that can be harmful to humans. His parents have embraced this and Logan can often be seen walking around the grocery store or the school with a gas mask and hazmat suit. He has almost become our leader in pest control at the school. Although Logan has been physically floating in and out of the classroom, his participation in class has been fairly minimal… up until a few months ago. At this time, his teachers and support staff started to notice that his strengths and passions could be used in the classroom more often. Although there has been much effort over the years to include Logan more effectively in the class, during a unit on communicable diseases, Logan’s experience at school shifted to a much more active, positive experience. He then became a classroom expert on the topic. He participated more in class discussions, he was engaged in the tasks, and walked with more of a “swagger” at school. One of his teachers, Colleen Giddings, then asked him if he wanted to share his vast knowledge of viruses with the class. The next day, Logan waited patiently and then when it was time, brought out his iPad and didn’t just share a few bits of information, he actually taught a mini-lesson on viruses! He walked around with his iPad and showed pictures and shared his knowledge and passion for the topic. Rather than trying to get him to participate, the challenge then became how to teach him timing – when and where to share his knowledge! As the class is a shared classroom, his other teacher, Kathy Lambert, continued to chat with Logan about other areas of interest and asked him if he wanted to bring his hazmat suit in to share his knowledge about safety. 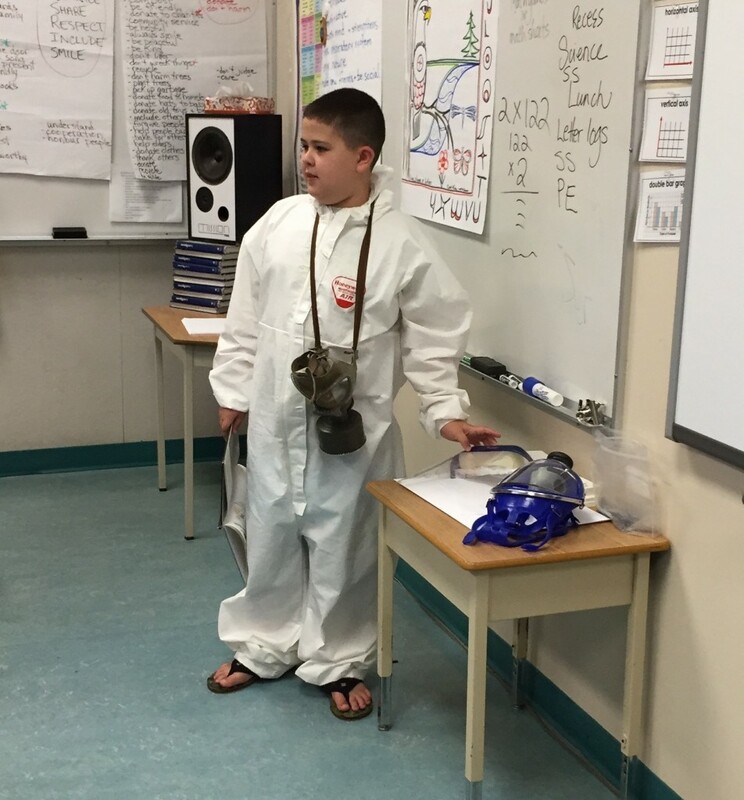 Not only did he just bring in his suit… he taught a full 30 minute lesson on nuclear disaster and radiation safety! He lectured and shared his knowledge, asked questions, answered questions from peers and also used a variety of tools like pictures, maps, stories, and even finished with a historical video on nuclear safety. This same student that struggled to be in class, speak to peers, read, write, self-regulate emotions… gave a 30-minute engaging lesson to his classmates. Logan is on a new streak and for the past few months, showed his story and identity at school has changed. Inclusion is not just about helping certain students be more involved in a class; it is a mindset about how we do things. Over the years, Logan’s family and staff at his school have embraced who he is and what he loves. They have started with his strengths and when these strengths were brought into the school, he became more confident, active and engaged in class. His struggles are still there but these have been overshadowed by his strengths. When we start with strengths, students flourish. When we start with strengths, we use these to build on our struggles. When we start with strengths, we work to INCLUDE. Thank you to Logan, his family, as well as the staff and students at James Hill for showing the power of using strengths in inclusion. Check out the 3-minute video clip below of Logan in his element… teaching his classmates about nuclear disasters and radiation safety. 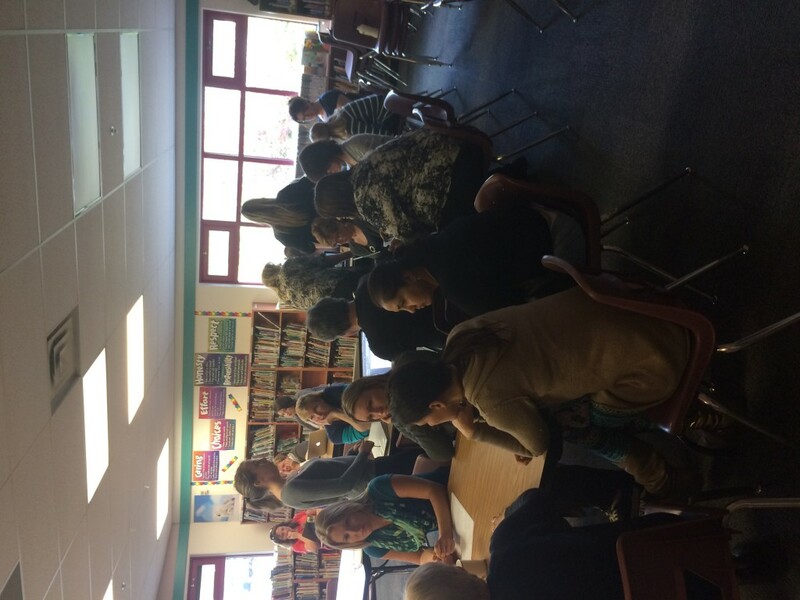 I recently had the honour or being asked to come back to work with the passionate educators of the Fort Nelson School district to continue our conversation in strengths-based education. For the keynote, we wanted to back up a bit and look at the importance of connection… the importance of relationships. We know we cannot teach a child without a connection. Talking about the importance of relationships is nothing new but sometimes we need a reminder of our WHY. 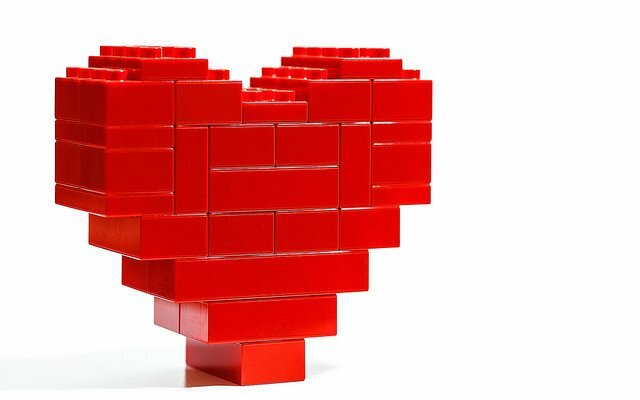 With the high volume of tasks, checklists and day to day duties in schools, our why (larger purpose) of making a difference through relationships can somehow get lost. 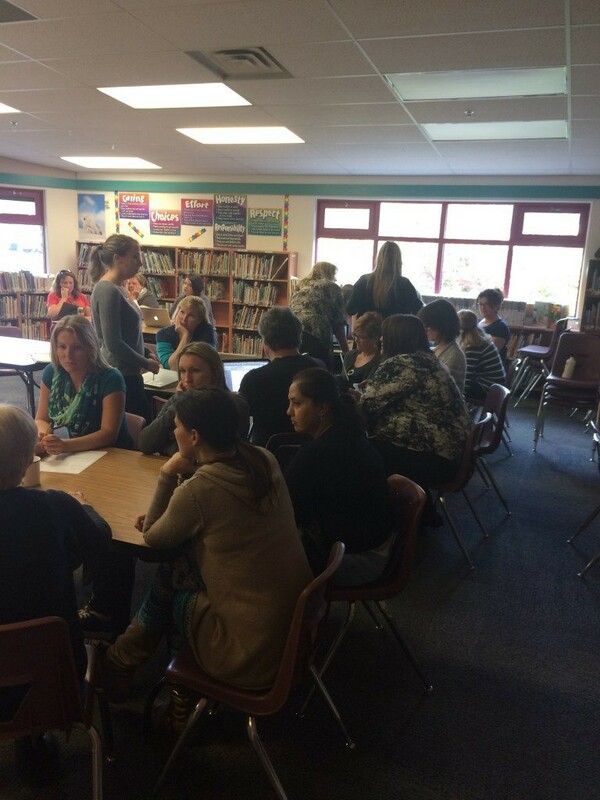 The session in Fort Nelson was designed to be a summary and a reminder of what is truly important in education. Connecting with students who are disengaged, acting out, absent, closed down, or have almost given up in school can be very challenging. Sometimes students, no matter how much we seem to try, will continually shut us out and/or push us away. 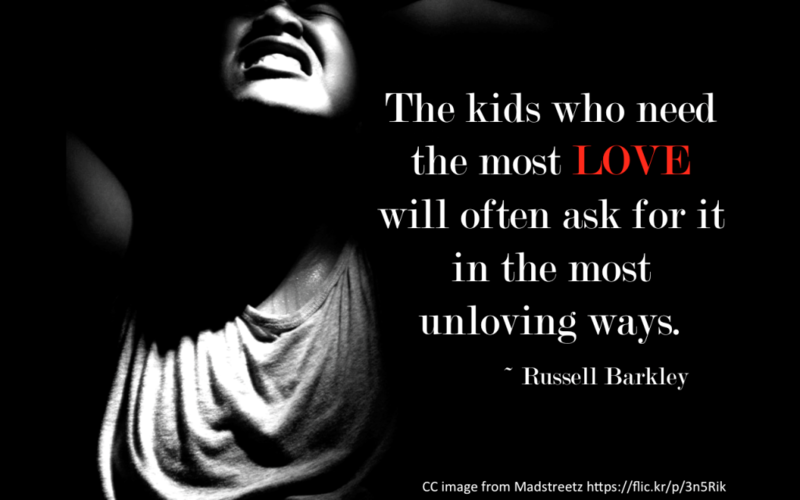 As Russell Barkley writes, “The kids who need the most LOVE will often ask for it in the most unloving ways.” We must remember our why, stay the path through the bad and the good to connect with our kids that need it the most. Connecting is more important now than ever. According to a 2011 study of youth done by the Public Health Agency of Canada, just over half of our grade 10 students feel that they belong and have a teacher that cares about them in school. It is difficult for me to hear this as I know how hard we work in education. How can almost half of our students not feel cared for and a sense of belonging? 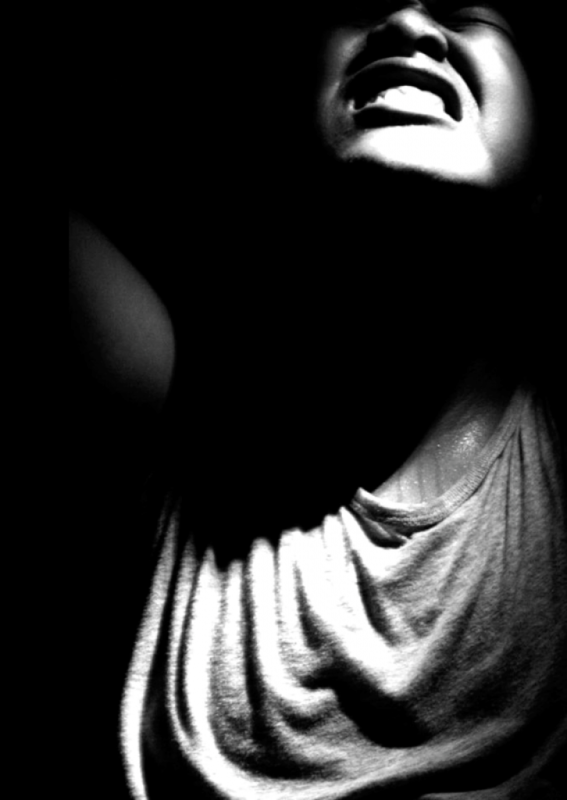 The question must me asked… knowing this, now what? We know the links between positive school environment and mental health and we know the impact we CAN have on our students so what are we doing about this as educators, schools and as a society? 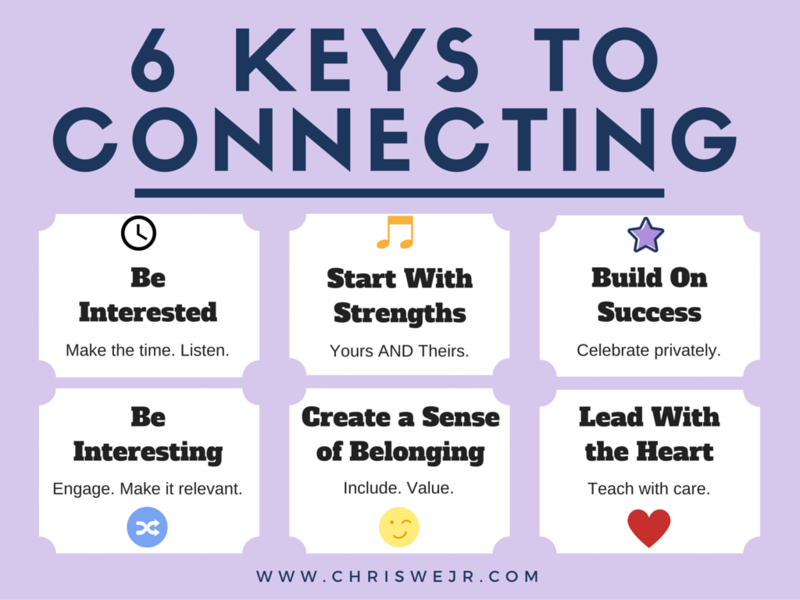 I know there are many more but here are my “6 Keys To Connecting” – these keys are designed to create connections, moments, memories, and an overall positive school experience. Be Interested. Make the time. Listen. Build trust. Josh Shipp tells us that “To a child, trust is spelled T-I-M-E”. We need to make the time to listen, get to know students, and build trust… and we must make this a priority. Spending just a few casual minutes a day or per class with a student that lacks connection can go a long way. Greet every child, every day. As students enter our schools and classrooms, acknowledge them. Say their name. Value them. Let them know “they matter”. Greeting a student is something that takes zero additional time but can have a lasting impact when done over time. Listen – truly listen. My kids remind me to “Listen with your eyes, Daddy”. Take a moment to not listen to simply respond or solve something but to listen to… just listen. When you make the time, you listen, and show you care, you will build trust. When you have this trust, students will let you in to their stories and you can then better understand their behaviours and where they are coming from. This helps to meet them where they are at and help from there. We know we are busy but we must always make time to be interested. Start With Strengths. Theirs and yours. I have written extensively on this topic as I truly believe it can create significant transformations in school culture (watch a recent TEDx Talk from me on this). If we find what we are looking for, what ARE we looking for? What do we see? Look for both the character strengths and the strengths of skill and then tap into these with our students. I believe that the best way to connect with a child is through his/her strengths. Rachel Macy Stafford reminds us that we have many butterflies in our school – those students who we regularly see fly and are beautiful in what they do. The challenge is to find the fireflies – those students who only shine under the right conditions. It is our job to create the conditions for these fireflies to also shine and show their beauty. When we know students’ strengths, we can tap into this and even place them in leadership roles to help bring out the best. Not only do we need to look for the strengths in our students but we also need to use the strengths of ourselves. It is no secret that when people spend time in an area of strength, they are less depressed, less anxious, and have more joy in life. This is true in school as well – for students and staff. I encourage people to bring in their strengths to their lessons and also volunteer their time once in a while at lunch or before/after school with kids in an area of strength. There are few stronger connections you will make with kids than when you and the students are engaged in activities in an area of strength. Celebrate and Build on Sucess. Many of our students who lack connection have gone through their school life on a “losing streak”. They have not experienced success for months or years. The thing about a losing streak is that it only takes one “win” to snap it. When we seek out the good and then find, capture, and share it, we can snap the streak and sometimes even start a new positive one. I am not a huge fan of public acknowledgement. I know it works for some people but I prefer a more private moment. When you see a positive in a student, acknowledge it privately with feedback and a pat on the back, a fist bump or just a message saying thank you and you appreciate the effort. With the access to technology, we can also capture this in a photo or video and share it with the student, his/her family and, depending on the student (as well as permissions), with a larger audience. Be Interesting. Be relevant. Be engaging. George Couros asks us, “Would YOU want to be in your class?”. Telling kids they will “need this in the ‘real world'” doesn’t cut it. It needs to relevant right now and connected to their lives. This is the same for adults – it is very difficult to learn anything when we are disconnected from the purpose. We often take ourselves too seriously when we need to be more vulnerable, share who we are, and bring joy and passion into the classrooms (and other learning environments). As I have been told by my kids, it is time to “let it go” – laugh, smile, and take risks with our kids. I know there is a needed balance but the “never let them see you smile before Christmas” simply pushes kids away. In addition to making our own classrooms more relevant and engaging, we can look to doing more school-wide events that make overall school life more engaging for kids. We can also develop programs that are purposeful and relevant for students (ex. trades, arts, etc) that also tap into the strengths of students and staff. Students often see us as “teachers” or “principals” rather than who we are. Being an educator is a huge part of who I am but it does not define me – it is part of my story. By sharing my love of dogs, I always have kids bringing their dogs and new puppies to meet me. This is a connection developed just because I shared a little of who I am through a video when I started at my school. Lead with the heart. Teach with an ethic of care. Students may not always be listening but they are always watching. How we teach becomes what we teach – we are always modeling what we believe through our words and actions. I understand the challenges we face but we must always do our best to ensure that the decisions we make must comes from the angle of what we believe is best for kids. As the late Rita Pierson said in her TED talk, “Every Child Needs a Champion”. Why not you? In the end, we need to start with these keys as individuals and also combine this with ideas and events that create more of positive culture as a school. We cannot do this alone but we can start with one. We can start with just one of our students who seems to lack connection and make the time, learn his/her strengths, build on success, make it relevant, ensure they are included… all the while by leading with our heart. Download a PDF of the summary slide. How do YOU connect with students? What was missed? As a school principal I am always reading leadership books and listening to podcasts on how to create the conditions for an effective organizational culture in schools. Each school and organization is different but I have appreciated the books by authors such as Dan Pink, Jim Collins, Steven Covey, Robin Sharma, Seth Godin and many others that have focused on the emotional aspect of organizations. Pink’s book “Drive” (based primarily on the research of Edward Deci and Richard Ryan) has been instrumental in helping me to work to create an environment that makes professional autonomy, mastery, and a sense of purpose at the core of what I can provide for staff members to help bring out the best. An area that I continue to see having a large impact on organizational culture in school is strength-based leadership. The idea is rather simple: encourage staff members in areas of strength as much as possible and watch them flourish. Educators are often highly criticized by the public (you will see that many governments do not follow the research referenced below when working with educators) so a strength-based lens really helps to create a more positive organizational culture that focuses primarily on what we CAN do rather than all the things we CANNOT do (yet). My reading recently led me to some research that supports what I have observed actually works in education and this research was not conducted in the field of education. The Corporate Leadership Council surveyed over 19000 employees in 34 large companies (ex. Canon, Lego, LG, Lowe’s, H&R Block, Caterpillar, etc) in 27 countries to determine what are the key strategies to increase performance in the workplace. The paper was released in 2002. It is a lengthy document (but well worth the read) so I have summarized what I believe are the 8 (alright, there are more) key points from the research. I am not a huge fan of quantitative data, but I believe there are some very important trends in this research. I have added my thoughts as they relate to the role of school and district administration (in italics). Employee understanding of performance standards resulted in an increase of 36.1% in individual employee performance. Providing clarity around what is expected in our schools is key to teacher and staff performance. I am not saying that principals decide these expectations but are we (principals and district leadership teams) asking our teachers and staff what quality instruction looks like? Is this clear to new and experienced staff members? Do we have a vision of instruction at our schools? 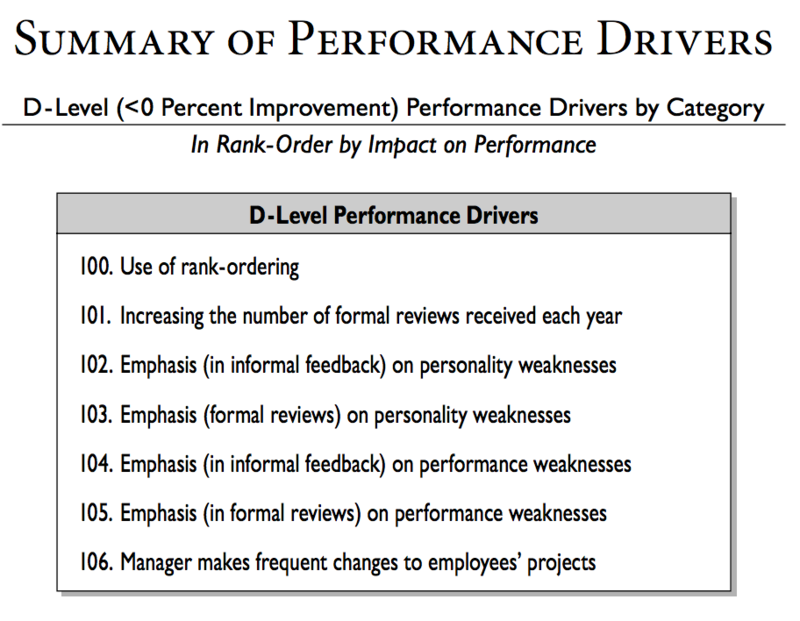 On the other side of this performance management aspect, the use of ranking employees (sometimes done in the US through test scores) resulted in an extremely low increase of 0.1%. A culture that encourages risk-taking resulted in an increase of 38.9% in individual employee performance. By promoting a risk-tolerant culture, employees are encouraged to push themselves beyond their current practice (p. 21a). How much of our school culture is based on compliance? Do we provide autonomy and time for teachers and staff to try new things and take risks? How do we support this? Internal communication resulted in an increase of 34.4% in individual employee performance. When employees were able to engage in effective communication with their peers, believed that management was sharing all relevant information, and felt they had a voice with management, performance significantly increased. Are principals and district leaders sharing all relevant information with teachers and staff? How is this information communicated? Are we facilitating time for collaboration and communication for staff members? Are we creating the conditions for teachers and staff members to be heard and feel they have a voice in our schools? On the other side of performance culture was that “differential treatment of best and worst performers” (ex. bonuses for better performers and the weeding out of low performers) only resulted in an increase of 1.5%. “Weeding out underperformers and rewarding top performers does not in itself provide employees with information, resources, or experiences that directly improve their performance” (p. 21a). Helping find solutions to problems at work resulted in an increase of 23.7% in individual employee performance. Helping employees to attain needed information, resources, and technology resulted in an increase of 19.2%. Are we helping to make the job for teachers and staff members easier by solving problems and providing them with the needed tools? I remember Chris Kennedy said to me, “it is our job to give good teachers the tools to become great”. I know our budgets are tight but do we provide enough resources to help our good get to great? On the other side of the manager-employee interaction aspect, “measuring employee performance and results” resulted in only a 5.6% increase while “making frequent changes to projects and assignments” resulted in a decrease of 27.8% in individual performance! Can we please move on from measuring and ranking teachers using test scores? How often do we ask people to shift the focus to a new goal, a new flavour for professional learning? Are our school and professional plans for one year or longer? Are we given the time to take our projects to completion? Emphasis on performance strengths (in formal reviews) resulted in an increase of 36.4% in individual performance while the emphasis on performance weaknesses resulted in a decrease of 26.8% in performance. (In addition, an emphasis on personality strengths resulted in an increase of 21.5% while an emphasis on personality weaknesses resulted in a decrease of 5.5%). The swing from emphasizing performance strengths to emphasizing weaknesses results in a whopping 63.4% in performance! In our feedback to staff during evaluations, is the focus on strengths or weaknesses? Are we continually taking the time to acknowledge the strengths of our staff members? We always want to provide each other feedback for improvements, being “tough” or providing too much negative feedback can undermine the goal of the performance review. Providing fair and accurate informal feedback resulted in an increase of 39.1% in individual performance. Manager knowledge about employee performance resulted in an increase of 30.3%. 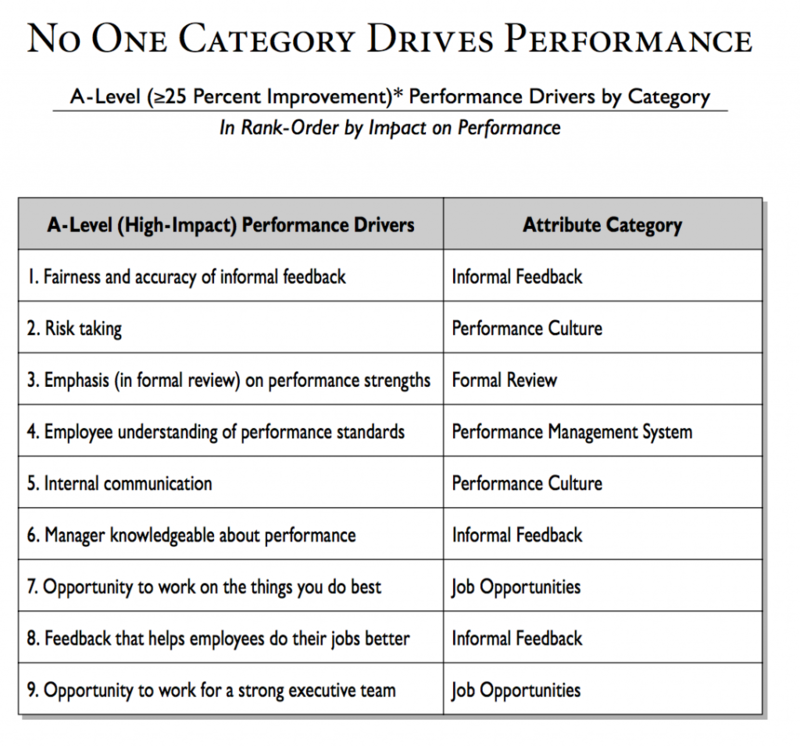 According to this research, fair and accurate feedback was the single largest driver of individual performance. How often are we in classrooms and follow up with informal fair and accurate feedback? In order for us to have knowledge of performance, we need to be in classrooms – how do we make this a priority? Instructional Rounds may be something to consider so feedback is not solely coming from admin. Providing informal feedback that helps employees do their jobs better resulted in an increase of 25.8% and emphasizing personality strengths in this feedback resulted in an increase of 22.3%. Are we providing helpful feedback? Is there a relationship there that makes the presence in classrooms and informal feedback actually valuable? When we are in classrooms, does our presence and follow up feedback actually help or hinder performance? On the others side of informal feedback, when performance weaknesses were emphasized, performance actually decreased by 10.9%. Being provided with the opportunity to work on things you do best resulted in an increase of 28.8% in individual performance. The opportunity to do things people do best “contributes more than any other on the job development or training opportunities to improve performance” (p. 43a). Do we know the strengths of our staff members? Are we aligning opportunities with these strengths? Are we encouraging leadership opportunities in areas that people do best? Be in the classroom more often – not to “hover” or just to be there to provide informal feedback but to also find out what the strengths of staff members are and to determine the resources staff members need to be successful in their jobs. Often we need to provide ideas, feedback and needed resources, then simply get out of the way. Make sure feedback (formal and informal) is fair and strength-based. Ensure that staff members feel they can take risks in their classrooms and have the time/resources to support this. I need to also make sure that staff feel that I will support them if they take a risk and it does not go as planned. Have more dialogue with staff around creating clarity of what effective instruction looks like. Yes, there are many ways of teaching but are there certain characteristics that we should be striving for in our schools? This needs to be a staff discussion and not a principal-driven expectation. I often hear that the principal needs to be the “instructional leader” which I believe is flawed. As a principal, I teach only a small amount and I think that we need many leaders of instruction on staff and the principal needs to be a part of this… with teachers. Staff should drive the conversation on clarity of expectations in our classrooms and it is up to us (as admin) to create the conditions for staff to be supported to meet these expectations in the classrooms. Make time for effective communication. This involves helping to ensure there is effective communication between staff members, making sure I share all relevant information (and build trust with transparency), and actually take the time to LISTEN to staff members. Provide leadership opportunities in areas of strength for staff members. When I look at the above list, as a teacher, it seems these were also goals for me with students and the classroom community. Although this research is not from the field of education, it was timely for me but I also wonder what was missed from this? What other ideas and areas (particularly in education) can help create a “high-performing workplace” in our schools? As I strive to grow in this area I would appreciate thoughts from teachers, admin, as well as people in other fields. How do we create the conditions that bring out the best in the educators in our schools?